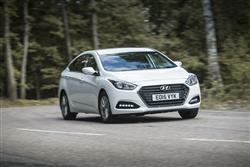 Find out everything you need to know on the new Hyundai I40 from independent vehicle review website Car And Driving. You can watch the video review to the left to see more of the car or read their written review below to get a true insight from an expert in the automotive industry. Hyundai's i40, the brand's first stab at modernday medium range Mondeo-class motoring, caught a lot of its rivals on the hop. It's been updated, so they'll need to be on their mettle all over again, as Jonathan Crouch reports. The Hyundai i40 has performed well in the medium range sector, so it's a case of keep on keeping on. The engines get more efficient, the technology becomes more impressive and the i40's rivals are looking ever more worried. Some car manufacturers have a watershed moment where they spring from mediocrity to credibility either with one landmark car or a generation of models. Hyundai haven't really worked like that. For the Koreans, respect has been hard-earned and has come through many incremental improvements to its wares. As a result, there will be many who may not have realised quite how good Hyundai cars have become if they haven't sampled one within the last decade. The i40 medium range saloon and estate line-up is a case in point. If the last big Hyundai you remember was the almost appealingly inept XG30, the i40 is going to seem like something from a different planet. Still, it didn't get an easy start in the UK, where it was launched into a sector that was on its knees. The medium range Mondeo-class market is showing signs of a pulse these days and Hyundai is sitting pretty with its latest updated i40 range. Of course, efficiency is the watchword when it comes to introducing new engine technology and Hyundai have made great strides in that area too. In the company's transitional phase, it had the styling and the equipment levels taped, but the engines were always a couple of years off the mark in terms of efficiency. That's no longer the case. The i40 is available with an engine line-up of two Euro6-compliant diesel power units with either 115PS or 141PS. A seven-speed dual-clutch transmission is available for the upgraded 1.7-litre diesel engine with 141PS. It provides improved fuel efficiency and offers drivers fully automatic operation or manual gear changes through paddles on the steering wheel. For better cornering and to improve the overall agility, the i40 offers Advanced Traction Cornering Control (ATCC). The system uses electronic sensors to emulate the behaviour of a limited-slip differential during cornering, providing additional traction, better grip and improved handling. The Tourer estate is also engineered for the Rear Electronic Damping Control System (ECS). The driver will thus be able to adapt the suspension settings through the drive modes to suit his or her driving style. Borrowed from the upmarket Genesis, this system also alters the characteristics of the electrically assisted power steering, the transmission logic and the sharpness of the throttle pedal. Not a lot has been done to the i40's styling because not a lot needed to be done. Many commentators would identify the i40 as the most handsome car in its class, but the Koreans have been unable to resist a few minor tweaks here and there. There's an updated design for front and rear lamps, a hexagonal grille, a revised front bumper, and integrated LED fog lamps as seen on the Genesis. The profile is refreshed by newly-designed 16 and 18-inch alloy wheels. The Hyundai i40 Tourer estate version offers a sleek 'sportback' style profile coupled with any number of smart details. Check out the concave C-pillars, the intricately finished headlight units and door mirrors, the slashing swage lines in the front wing and the bold wheel arch treatment. The interior looks good too, with a centre console stack that's redolent of Ford's latest offerings, a reassuringly chunky steering wheel and a decently sized luggage bay. There's an ample 525-litre boot on the saloon model, while the Tourer delivers 553-litres to the tonneau cover and 1,719-litres in total with the seats folded. With prices opening at just over £19,000, the i40 offers a Mondeo/Insignia sized car for Focus/Astra money. There's a £1,200 premium if you want the Tourer estate rather than the equivalent saloon bodystyle. That sort of value proposition is hard to argue with, especially when it's backed up by Hyundai's excellent warranty. Five Year Triple Care, will come as standard on i40. This package features a five-year unlimited-mileage warranty, five years' roadside assistance and five years of vehicle health checks. There are some intriguing technological highlights on offer. As well as the existing Lane Keep Assist System, additional functions include a Smart High Beam (SHB) system, which monitors approaching traffic and automatically turns off the high beam to avoid dazzling other drivers. The Speed Limit Identification Function system checks roadside signs and displays a current speed limit alert to the driver via the TFT display on the instrument panel. The inbuilt navigation system has also been upgraded with enhanced touchscreen functionality and better graphics. Both available audio systems have also been optimised, the upper specification one featuring DAB radio. None of this tech is anything you haven't seen before on plusher cars, but you may not expect to find it in a Hyundai saloon. The old i40's 1.7-litre diesel engine did fairly well in terms of efficiency, emitting just 113g/km of carbon dioxide, but this latest i40 brings in a bunch of incremental improvements. The addition of stop/start, low rolling-resistance tyres, a high-tech alternator and an active air flap in the front grille will certainly get business users interested. Residual values have held up extremely well, used buyers attracted to the remainder of the five-year unlimited mileage warranty. Sell this car at three years old and it still has two years of warranty cover left, whereas a Ford Mondeo or a Peugeot 508 driver will be on their own should anything go wrong with their vehicle. Despite sales of medium-range saloon and estates suffering in recent years, don't take that to mean the sector suffers a paucity of talent. Quite the opposite in fact. Cars like the Ford Mondeo, the Mazda6, the Skoda Octavia and the Volkswagen Passat aren't going to just roll over and let the Hyundai i40 scalp their sales. As good as it was, the i40 probably needed more eye-catching improvements than it has received in order to really put one over on these cars. Underestimate the i40 at your peril though. Quietly and efficiently, it'll improve and before you know it, all that we thought was true about Japanese and European superiority in this sector will be built on sand.